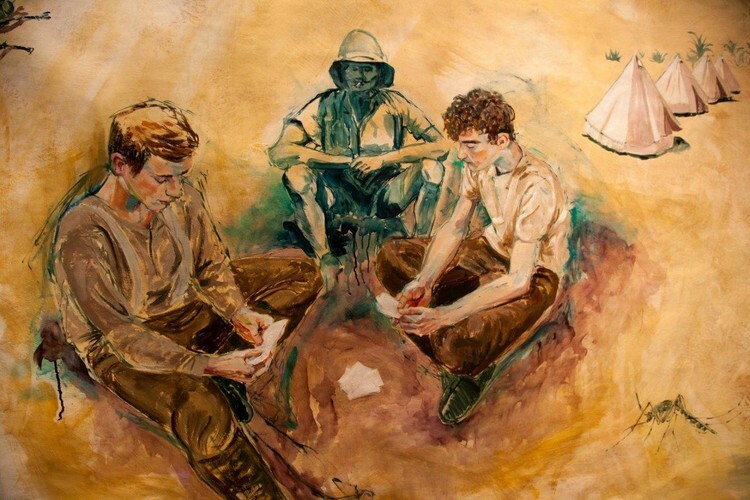 A visual arts project aimed at acknowledging the role of the New Zealand Mounted Rifles in the First World War. Sand in the Apricot Jam was first exhibited at Expressions Art Centre in Upper Hutt where the artist Rebecca Holden created most of the artworks on site. The intention of the project and resulting exhibition was to be as inclusive of the local community as possible – from the local horse owners, who allowed Rebecca to sketch their horses, to young men who volunteered to pose for the paintings. The works look at the role of the New Zealand Mounted Rifles in the Middle East campaign, as well as their contribution at Gallipoli. Rebecca's grandfather served with the Auckland Mounted Rifles and was wounded at Gallipoli. He returned to serve with his regiment in the Sinai and Palestine until the end of the war.